Rachel D. "I have been going to Dr. Pfister since he took over for Dr. Domb. I have nothing but great things to say about him. I feel he is fair, knowledgeable and genuinely concerned for his patients. His staff is friendly, professional and very helpful if you need to get in right away with a problem." Dr. Pfister's passion for non-invasive biologic dentistry began while practicing dentistry in Hawaii and he learned of the power of ozone in dentistry. From Hawaii, Dr. Pfister moved to his hometown of Upland as the protégé of the world-renowned ozone dentist Dr. Bill Domb. In 2015, Dr. Pfister relocated his family to Dothan, Alabama where his wife is from and his grandparents live. They were thrilled to have their 4 girls connect with their southern roots. 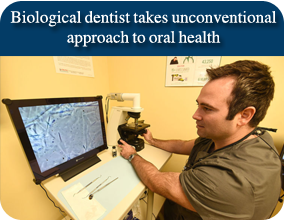 Dr. Pfister practices Biologic Dentistry and maximizes the power of ozone, micro air-abrasion dentistry, cavity re-mineralization, alkalization of the mouth, and other homeopathic and minimally invasive techniques to help every patient be as healthy as possible. Dr. Pfister is a proud accredited member of the IAOMT (International Academy of Oral Medicine and Toxicology). Certification through this well-respected organization confirms that he follows the proper process when removing silver amalgam fillings, practicing the highest standards of safety for his patients. 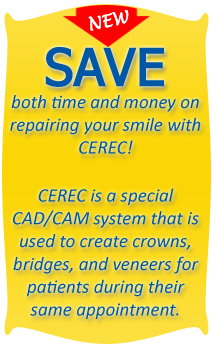 Take advantage of the latest in digital radiographs, digital photography, polarized infrared light to diagnose cavities(DIAGNOcam no-radiation technology), phase-contrast microscopic evaluation of periodontal bacteria (spirochete evaluation), ozone and CO2 periodontal laser treatments to receive the very highest level of dental care! Dr. Pfister is passionate about always learning, and remains extremely active in post-graduate education. He has been an active member in the following organizations and constantly rotates his post graduate education through various organizations. In our Dothan dental office, patients have the opportunity to complete dental material compatibility testing. This test will inform your dentist of any reactivity within your body to specific dental materials. Dr. Pfister only uses the most biocompatible materials.